Over the years – the years before I had a child of my own, I got the impression that all moms have guilt (and I still think we do – often for ridiculous things). Maybe even that all moms should feel guilt. To be clear: I know the should part seems ridiculous when put out there in print like this. However, there are so many articles out there about how stay-at-home moms feel guilty that they don't provide more for their families and how working moms feel guilty that they aren't there for theirs. So I just figured there was no way out of having guilt around that topic. But at some point, before I had my son, I realized that not every mom feels guilty. At least not about the to-work-or-not-to-work decision. Nor should they. I was talking with a stay-at-home-mom friend of mine, presumably about something I assumed she would have guilt over. And she stated very clearly that, actually, she didn't feel guilty at all. Somehow this was mind-blowing. I'm sure I just said something like, "Oh. Well, good." But I think, in the back of my mind, I thought: "Wow. Well, that was bold ... (How dare you?)" Fast forward (I don't know how long – a year or two) to when I had my own newborn. 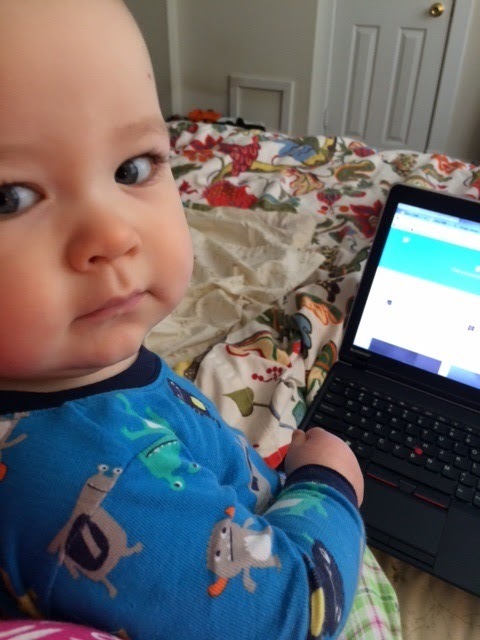 At my postpartum appointment, my doctor – of all people – gave me what would become the best piece of advice I received about going back to work. (And actually, I don't know why I say "of all people" because my doctor is a woman who has kids. So she's a smart working mom! In fact, a probably crazy-busy, smart working mom. But anyway, I was not expecting to receive my best piece of returning-to-work-advice from my doctor that day. So, it felt like an unlikely source for the most empowering piece of wisdom I received on this matter.) She told me two things: 1) She said, "You shouldn't feel guilty about going back to work." Ok. Cool. Heard that one before. Easier said than done. And then she said, 2) "And you shouldn't feel guilty about not feeling guilty." What?!!? Not feel guilty about not feeling guilty? Those words had a dissonant effect within me – they seemed jarring and confusing. But while they were unsettling, they also felt very real. I held on to them. Two more weeks of maternity leave and, while I loved being home with my little guy, I started gearing up for my return to work in two more. By that point, my awesome sleeper (which was helped by the fact that he was 11 lbs 3 oz at birth!) was eating every two hours during the day to get in the nutrition he needed to make it without waking overnight. So, while I appreciated the extended sleep at night, I was exhausted by the constant nursing and the inability to now get anything done while home during the day. My days were a cycle of: nursing, diaper changes, playing, sleeping. Every two hours! And the sleeping part only lasted about 30 minutes – which never seemed like enough time to finish things around the house before he was up and nursing again. I was wiped. But I no longer felt like I was getting anything accomplished. At least when he was going 3-4 hours between feeds, I could finish a household task in one setting during his naps. Plus, because I am so results-oriented and felt very responsible for his development, I know I went into baby stimulation overdrive during his play times. We would read books, shake rattles, lift our heads during tummy time. All the normal things. And it actually sounds so leisurely as I've described it. But in my head, it was a bit frenetic. I played with him like IT WAS MY JOB. And I realized, I needed to return to work. I needed other people to play with him (or just let him be for a change - ha!) like it was their job. And I needed other adults to interact with and to accomplish something other than the very (slow) incremental changes that a baby experiences. As the final two weeks of maternity leave ticked away, I cherished every day. We had an awesome last-day-with-mommy-home day. And then, as I planned to return to work on Monday, the weather (which had been decidedly cold but hardly ever snowy during my maternity leave) decided to act like winter and threaten a snowstorm. And all I could think was: Nooooo! I need out of this house! I need to go to work! Plus, I needed for my last day at home to be my last day. I couldn't handle the emotions of another "final" day. I couldn't handle all the buildup and then a huge letdown. Even my husband – who loves snow and who was actually super stoked we were going to finally get a decent amount that first week of February – realized quickly he had to squelch his own desires for mine and my sanity. And thankfully, the snow was not as predicted (although it did proceed to snow more that winter after I returned to work than when I was home - boo), and I was able to return to work as planned. And as much as I missed my baby boy and had to adjust to being away from him, being back at work felt right. Even with the exhaustion of pumping and working, it was right. Even though I felt like we barely saw him on weekdays, life started to fall into place. And I realized: I didn't feel guilty. I just felt better. But I did have a slight urge to feel like I should feel guilty. But the words I'd tucked away were there, waiting and readily available, as if I'd always known I would pull them out. And while they felt a little wrong at first, they were exactly right - a perfect fit - for me. I have since reflected on why. I realized that it doesn't make me a bad mom that I enjoy doing something else with my life than stay at home with my awesome son. It actually makes me a better mom. Not because working moms are better. (If there's one thing I learned while being home, it's that being home all day is extremely taxing – even though there's often nothing to show for at the end of the day [other than having a well-loved and cared for child – which, I get it, is the thing!].) But I'm a better mom as a working mom because I'm teaching my son who I really am. If I all of a sudden stayed home because it was part of an earlier vision for my life or because I think it's good for moms to stay home, my son wouldn't get to know the real me. The me who had been working for 14 years before he arrived. The me who enjoys balancing life and producing good work and being around people who challenge and grow me and make me more of who I want and need to be. And the me who yearns for every minute I get to spend with my son because I now feel less bogged down by the routines of a nursing mom. The me who feels blessed by my ability to devote my weekdays to work and my weeknights to him and his dad (and to getting stuff ready for the next day), and really appreciates my weekends now. I’ve learned: that's the real me – at least in this phase of life. That's the me I'm glad my son will grow up knowing. Instead of a bitter, hostile and resentful me, which is who I think I would become unfortunately, if I were home all day every day. Instead, he will know the me who puts his dad and him first. But because I work, they are not my first and only things. Because they can't be. Because if they were, I might crack. So it would be wrong, dishonest, for me to try to make my favorite guys in the whole wide world my everything and deny a big part of who I am. And because of that, I do not and cannot feel guilty (at least not about going to work). And I'm convinced that my son will be all the better for it. But to be clear, I am not writing this to justify my need to be a working mom. I reconcile that every time we pay bills. For us, it makes sense for me to work. But I write this for other moms, who either feel guilty about working or feel guilty about not feeling guilty. I want you to stop. Stop. Feeling. Guilty. There will be plenty of times ahead where you will fail your child or your spouse or your parents or your friends or your boss or God – really fail them – because you didn’t try hard enough or you were too harsh or you refused to forgive (or for Christians, because you didn’t rely on God’s strength instead of your own). For those things, please, by all means, feel guilt. But use it for good: seek forgiveness, change that behavior and move on. (Easier said than done, I know.) But if you are truly being the best mama that you can be, and that involves the need to work – for whatever reason – there is no need to also feel guilty. Just be you – which means being the best working mom that you can be – and the rest will work itself out. Your child will know you. Your child will feel loved by you. And your child will be all the better for it. 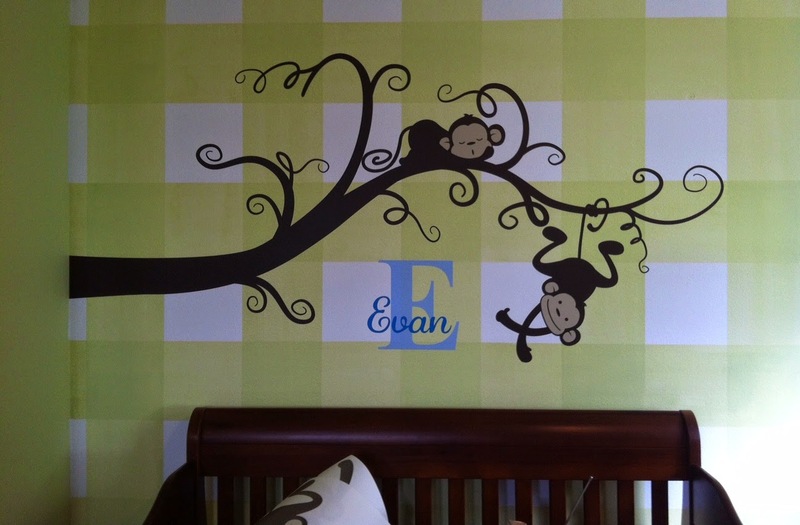 Gingham & Murals & Monkeys, Oh My! 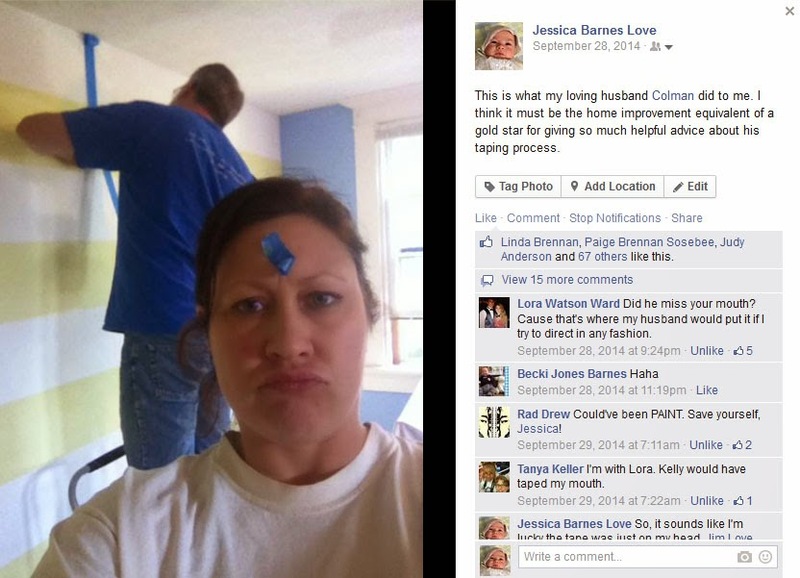 I'm afraid of paint colors. Not run out of the room and hide under my bed afraid. But afraid, nonetheless. Actually, I take that back. I love it when others embrace putting color on their walls. I just don't know how to be those people. Most of the walls in my home are some shade of beige. In our last home, the dining room was a somewhat strange burnt orange color when we moved in. It was the same color when we moved out. We didn't change it. I was too afraid. But that all changed when I got pregnant. At least in the baby's room. Now, mind you, I didn't go crazy wild with color. I'm not trying to allege that here. But I let loose my creativity, embraced color in general, and created a one-of-a-kind nursery for our son. The nursery that everyone said we wouldn't get much use out of. But we do. Every day. I often feed him in there. We "play" in there. (He's 2 months old. So, play is relative.) He takes at least one nap a day in there when we're home. Heck, I go in there when he's still asleep in the co-sleeper in our bedroom and do my devotions by myself before anyone else is up. And I fully intend to move him into his nursery for overnights once he's six months old. It gets used and will continue to do so. The nursery that we were told would just become a dumping ground. And truthfully, the closet sort of is because old habits die hard. (I'm horrible at folding clean clothes. Or when I actually do fold them, they often remain in the basket instead of getting put away. And since the nursery [formerly the guest bedroom] is the closest to our master, we developed a horrible habit of dumping there. But, I digress.) Mostly, the room itself stays pretty tidy. The nursery that I was told didn't HAVE to get done before the baby came. And while these were intended to be kind words, considering I was still waiting on his quilt (which we revolved the whole room around in terms of these fearless paint colors) to arrive from Pottery Barn in late August (after I ultimately had to cancel my order of the sheets, quilt and bed skirt package and reorder the quilt and bed skirt separately to actually get it shipped -- dang back-ordered bed skirt [which we finally received too!]) when the baby was due in November, they were inaccurate. I needed the nursery done. Yes, me! And I don't think there's anything wrong with that. Yes, it's true. Our baby doesn't NEED gingham checks and trees and monkeys on his wall. But why not provide those things if we can? As his parents, we are tasked with crafting him into the person we want him to be. I want him to be fun, creative and a lover of monkeys (they've always been my favorite animal at the zoo!). So, monkeys and checks, it is! But no, I know he doesn't need it all. And neither did I NEED it. I know that "need" is also a relative term. But I'm just so glad that we are fortunate enough that I was able to unleash my creativity (can you sense how wild this room is? ha!) in his space before he came. It made me feel like I was doing something to prepare for something that you can never be fully prepared for. It gave me a sense of accomplishment that my vision was coming to life, not unlike our vision and hope for a child that was literally coming to life inside of me. And it represents love. That we were thinking about him that much, spending that much time prepping a space for him and pondering what we wanted him to be surrounded by once he was here. And our hard work is already paying off -- when, at two months, he stares at the monkeys on his wall and I just KNOW he'll love his room when he gets older! THAT'S what I was going for! Not something to impress others with my decorating prowess or how well we can follow directions on Pinterest or how much we spent on our baby. This room was meant to impress our son! Oh, but before that, one more note: Before we started the project, my husband wasn't so sure about this vision that I had. Especially the gingham. Mostly, because he knew it would HAVE to involve him (I did everything related to painting by myself, except the gingham walls, because: 1) the measuring and marking and taping for that part is definitely a two-person job and 2) the paint thinning product to create the checks is no good for the pregnant people to inhale; he also helped with the trim), and it looked like a lot of work. And it was, in terms of precision, but not really in terms of time. But once he finished it, he was glad. Instantly, you could tell how proud of a papa he was of his work. He, too, had sacrificed his time and energy for love (something we've now become accustomed to) for the little one in my womb, and it had paid off in spades. Imagine that the above photos are of a guest bedroom, or an empty room for that matter. But alas, at least you can see my boring light beige walls of old. Note: Everything in the nursery was new to us (the crib, dresser and chest of drawers were found and acquired via Craig's List - my first ever Craig's List purchase, actually, and maybe my last after some recent headlines! ), except the recliner that Colman brought into the marriage and the TV from my college dorm days, oh and that little bedside table next to the futon (it was my parents' at one time!). Also, you can tell I took these photos, not Colman. Boo for poor quality pics. The pics below are of the cans of the "wild" paint colors we chose (that perfectly match his bedding). I took these originally to send to our church friend whom we "commissioned" to create a paper art piece for the room. We also sent her pics of the lamp shade and a link to the quilt for inspiration. We weren't annoying at all. We bought the paint the weekend before Labor Day weekend, but then didn't use it that weekend or the next. 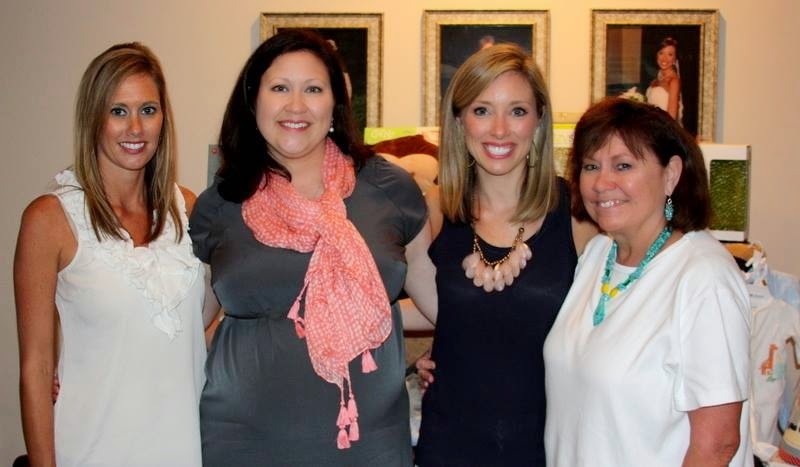 Instead, we went to Alabama for my first baby shower over Labor Day weekend. But then, two weekends later, it was on! Don't the clouds look heavenly? And THIS was the result! BAM!!! Once this was done, it just felt right. And then came the decals, which take longer than you would think. We thought we'd get them up in a morning (before heading to an afternoon wedding an hour away). Um, well maybe if we'd ordered fewer decals. But I, asking for very little, wanted trees and birds on four walls. Yes, I was huge (more than 6 weeks from my due date). But don't we clean up nicely? Later that night (in the middle of the night), I added the leaves to all the branches. Did I mention I had trouble sleeping while this project was in progress? But, I mustered the energy for church and a baby shower the next day. The next weekend, my mom was in town for another baby shower and watched as Colman and I finished the decals with the birds. Colman also came up with the precious idea of putting the leaves in the monkey's hand and having them spill to the ground. Now THAT's creative! This was also captured that weekend. Wow. That's real. Are you starting to see it? And then all the pieces started coming together. And then somehow, by some strange miracle, the nursery project was completed about a month before our son arrived, although we'd just started the work a little more than a month before that. Whew! Now, on to the professional finished product pics taken by my talented husband. The burlap banner in the window was made by my sister Angie for my first baby shower. I find it funny now that the quilt is such a small part of the room. But it was the source from which I drew all inspiration. The grass on the quilt is actually comprised of green gingham checks. The letters for his name were cut out of old Reader's Digest books. The framed piece is a cut paper design. There's a precious little baby in there! Spiritual Mothering ... What is that? 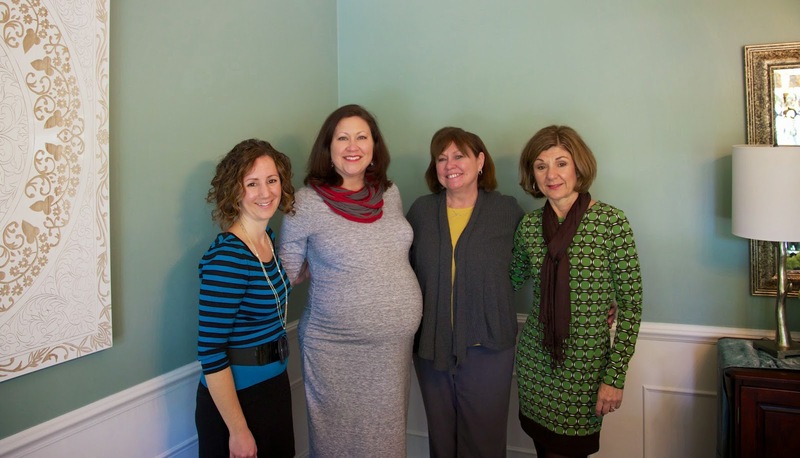 So, the subject matter is around spiritual mothering. Specifically, some of the triggering questions that were offered up to the SRT community were the following: How is spiritual mothering already taking place in your community? Has a godly woman influenced you in your growth in the Gospel, or has mentoring a young believer impacted your life? How would you like to see Titus 2 shape your relationships moving forward? Although I have had (and still have!) a number of wonderful Christian women in my life – many of whom have certainly pointed me toward Christ, when I think of those individuals who have set aside part of their lives to pour into me, everyone who is top of mind is male. And I don’t think that’s wrong. I’m thankful for these men. (And I hope I’m not currently blanking on some huge impactful period of my life where a woman devoted a significant part of hers to growing me in the faith. If I am, I’ll blame it on pregnancy brain. Seems to be my go-to excuse, which is mostly warranted, these days.) But it just feels wrong to say this. Like I am defying some century-old bond of womanhood where I am supposed to have a female in mind to offer this recognition to. But the truth, at least as I see it, is what it is. Men have been my spiritual mothers. But that’s not where this story ends. Just as many families get stuck in certain cycles (of poverty, of abuse, etc. ), I am convicted that I am perpetuating this problem for the women in my own life. I know that in the times where I have clearly pointed other women to Christ, it has felt amazing. But my most vivid memories of knowing I helped shape spiritual futures happened many years ago. Even though my husband and I currently host what our church calls CityGroup house churches that meet during the week. And I try to give something of myself to all of the women. And I’ve taken the time and effort, at times, to invest more in some of the women than others. But I know that there’s not a single one who I have poured my all into. Here’s where the excuses come again: We host this weekly group, plus we meet every other week with a couple to discuss their marriage (and by virtue of that, also ours), plus we serve on the greeting team, plus I spend a Sunday a month in nursery, plus I volunteer in other ways as needed, plus I work a pretty time-consuming and demanding job. Plus, I’m pregnant. And many of these service areas are genuinely about me giving time and attention to others instead of myself. But you know what? In truth, I want more. I want a woman, many years from now, to be able to look back and answer the above questions about having a spiritual mother differently than I did. And not for my own glory, but so that they can trace part of their growth back to a time where God put me in their lives or when God all-of-a-sudden spurred me into action in their lives. I’ve commented at SRT before about an idea that I have recently become inclined to initiate at my church called Apples of Gold. (Not that it has to be called that.) The concept is around older women mentoring younger women – with a regular component of the gatherings involving teaching them to cook and leading a devotion time. But I feel so inadequate about leading this for many reasons: 1) I'm not old! I'm 36. But in my church, I'm certainly not young. 2) I haven’t really seen this modeled. My previous church had this program, but I was never able to participate in it. I have just loved the idea of it for several years. 3) I’m not an expert in the kitchen. I’m a good cook. My husband and others generally enjoy the food I prepare. My husband probably even says I’m a great cook. But I don’t have mad chopping skills, or whatever I envision other women who would volunteer to do this have. 4) I don’t have time. (Who does, right?) But of all the times to get this grand idea, this timing seems the WORST! I’m pregnant with my first child while trying to juggle all of the things I already have going on. How does this work? But I know the answers to all of my questions and fears and excuses, while maybe not easy, involve Jesus. Jesus can teach me to model what I haven’t seen. He can guide me, if I let Him. Jesus can take away my insecurities. And in the meantime not allow me to hide behind them. And Jesus can help me find the timing. He can’t pray for me. He can’t trust in Him for me. He can’t put aside my selfishness for me. But he can guide my heart if I eagerly seek to follow Him in this. And if that means I have to give up something I’m already doing to accommodate a new phase in my life, he can help me make those hard decisions. So often, it seems that we get caught up in our own abilities or how we’re going to present something in this amazing way that we forget that the message itself is what is important. But the truth is, unless you’re a motivational speaker, the actual content of your message is what will be focused on for most presentations people attend. This is actually a very timely concept for me to grasp. I’m currently preparing to deliver training in D.C.; and the whole purpose of next week’s event is to judge how good I am at training. Gulp. (And I’m not normally a trainer!) The point is not for those in the room to learn the information. They will all be federal employees who already know the content. They just want to know if I know it. And there will be, I’m sure, an element of criticism around my delivery of the message that they want me to share. Ick. Super stressed. I already get nervous before presenting. But to present for the purpose of being judged!?! Not my idea of a good time. But I have to remember: It doesn’t have to be about that. If I know the materials (and in this case, that’s also the issue – just started prepping yesterday really), it will speak for itself. In fact, no amount of fancy speech and delivery skills will make up for not knowing my stuff. The content is far more important than how dynamic a speaker I am. And how much more so is that true when delivering the message of Christ! So often we are drawn in by powerful speakers. People who make us feel something. People with charisma and charm. But if we’re not careful, we can become less concerned about the actual message being delivered. And we can be duped by the messenger. Plus, dynamic deliveries often bring praise upon the messenger, more so than the message. But in this passage, Paul makes it clear that he’s not playing the orator. He is just a simple sharer of good news. He has a message, and he’s going to share it. But he’s not going to puff it up. He’s not going to be commended for how well he did in delivering it. He doesn’t want pats on the back for how great a speaker he is. He wants the focus to be on the message itself. On Jesus. 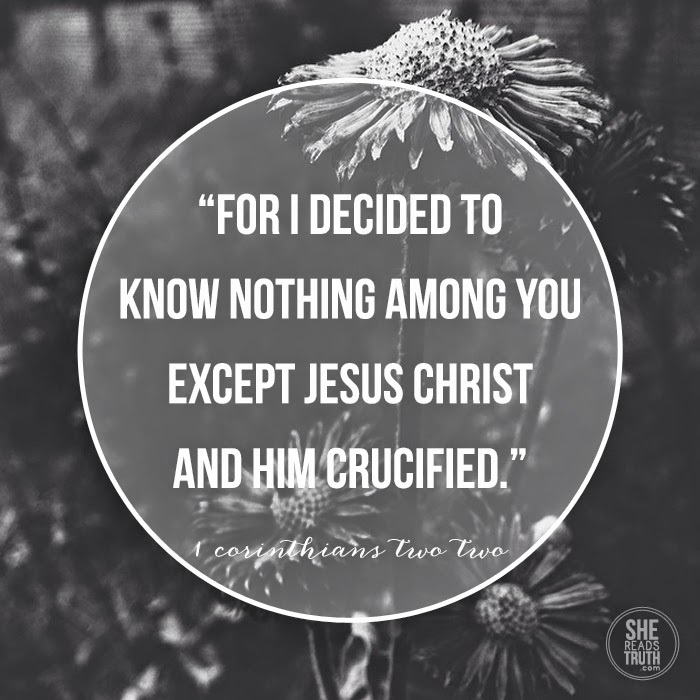 For that is what we are called to: “to know nothing among you except Jesus Christ and him crucified” (vs 2). If we know nothing else and share nothing else, and do it in a meek and humble way, we’ve done exactly what we’re called to. We are not called to making ourselves known. We are called to make Jesus famous. In our hearts. In our lives. In our communities. In our world. But we do that, not by being boisterous and bringing attention to ourselves, but by sharing him in all that we do and all that we say each and every day. Because really, our lives are not meant to be about us. They are meant to be about him. And he’s big enough and powerful enough that he doesn’t need our oratory skills to bring his message in such a way that it changes people. He can handle the changing. He just needs us to know him and love him and share him. He’ll take care of the rest. At the beginning of the book of Joshua, he has been commissioned by God to do THE BIGGEST THING he could ever imagine. Moses, the leader, has died. And Joshua, Moses’ assistant, will now put on the leader hat and deliver to these people the one thing they’ve been searching for – for most or ALL of their lifetimes: the homeland that God has promised them. But Joshua knows that the final scenes of this very dramatic story have the potential to be the most daunting. It’s not as if it’s just open and unoccupied land. It’s not as if it’s just there for the taking – first come, first serve. They will have to take the place away from those who currently consider it their home. And he’s guessing that these people are not just going to move out without a fight. I mean, it’s not like it’s a saved seat. There will be no: Excuse me. Umm, this land is actually ours. God was saving it for us. So I’m actually going to need you to find another place to live. (In fact, that tactic doesn’t even go over well when it is just a saved seat you’re squabbling over.) And the response will be something stronger than a sassy: Oh. Well. I didn’t see your name on it. So, Joshua is probably a little scared. Out of his MIND! So, the Lord tells him to be strong and courageous. He actually says it three times in the first nine verses. Be strong and courageous, for you shall cause this people to inherit the land that I swore to their fathers to give them (Vs 6). Only be strong and very courageous, being careful to do according to all the law that Moses my servant commanded you. Do not turn from it to the right hand or to the left, that you may have good success wherever you go (Vs. 7). Have I not commanded you? Be strong and courageous. Do not be frightened, and do not be dismayed, for the Lord your God is with you wherever you go (Vs. 9). God really wants Joshua to be strong and courageous. But how can he be? He needs a plan. He needs to know how to attack. He needs to know what type of enemy he is facing. No he doesn't. At least not yet. That will come. He really just needs God’s Word. It will provide all the direction he needs. And he needs to trust God on this. 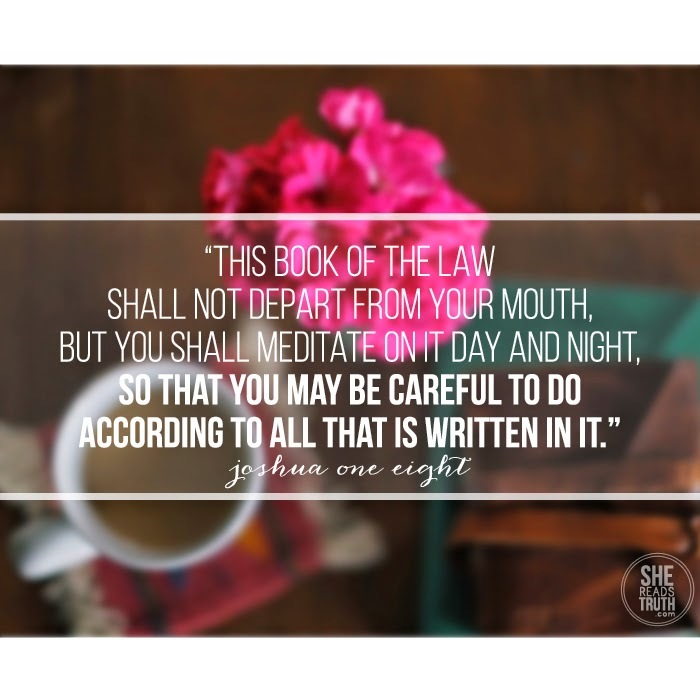 I’m going to guess that Joshua has read this Book of the Law before and never really saw it as a manual for a hostile takeover or an all-out war. It never really struck him as that kind of book before. But it is. Or it can be. If you meditate on it. God’s Word is meant to strengthen and empower us to face every scary thing we can imagine. He’s given it to us to grow our strength and courage. The rules are there to guide us, to keep us within the lines – on the path to success. And although, through Christ’s death and resurrection, we aren’t condemned by the law anymore, we are still to be bolstered by God’s Word. If we make it a regular part of our day, of our lives – meditating on it all the time, our lives will be better for it. While he certainly doesn’t promise that we’ll never have tough times, he does guarantee that his ever-present love and his Word will get us through it all. So, be strong and be courageous. The manual for getting through the tough and messy – the Bible – is readily available to guide us. If we’ll only meditate on it – allowing it to soak in, the rest will take care of itself. My name is Jessica Love. I have a print journalism background, but haven't worked in the field in years. I started feeling an itch to write creatively and/or from the heart again in 2011. (Most of my writing is technical these days.) This is where I do that ... I was conceived in Indiana. (I know, right? But it's important. See "Made in Indiana" and "Heart and Soul Defined" blogs from 2011.) Was born and reared (my mama doesn't allow me to say "raised" - "you RAISE chickens, we REARED you", she said) in Alabama. But God keeps calling me back to Indiana. (I went to college in Upland, IN; ultimately married an Indiana boy I met many years after graduating; and currently reside in Indianapolis and think I'm here to stay.) Thanks for coming to my site. Glad to have you along for the journey. Copyright Notice. 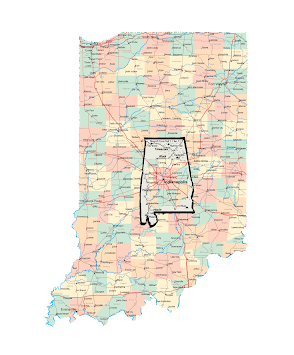 All text and photos on this site belong to Alabama Heart, Indiana Soul. Picture Window theme. Powered by Blogger.